The Brembo Master Cylinder, that perfect for every sports bike. With its adjustable leverage ratio, the perfect combination of lever travel and lever feel/firmness can always be found. 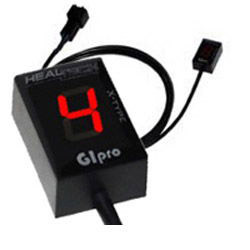 Because this is supplied with its own electrical brake light switch integrated underneath the cylinder, fitting it to road bikes is even easier than having to use the usual method of a hydraulic brake light banjo bolt switch and avoids the cost of this too. "In one word 'Awesome'. Yes the brakes where good before hand but now with the Brembo RCS fitted, the power of them is unreal." 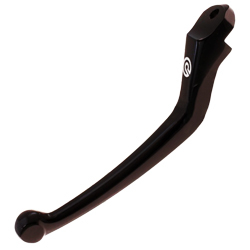 Ready to connect to your bike's standard/original or optional Brembo remote fluid reservoir - available below (separate/bike's original reservoir mounting bracket required). Supplied with Brembo double brake line banjo bolt and washers, single banjo can be added below if required. 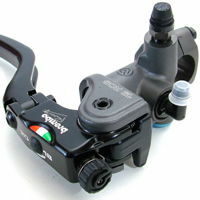 The Ultimate Brembo Master Cylinder, that perfect for every sports bike. 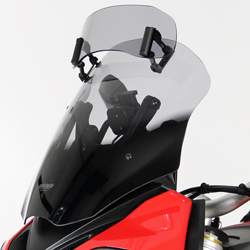 With its adjustable leverage ratio, the perfect combination of lever travel and lever feel/firmness can always be found and its unique and easily accessible rotating selector on the top of the master cylinder allows the rider to tailor the bite point exactly where they want it. 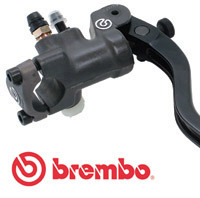 "...the biggest improvement I did to the brakes was fitting the Brembo radial master cylinder. The first time I grabbed a fistful it nearly had me over the bars!" 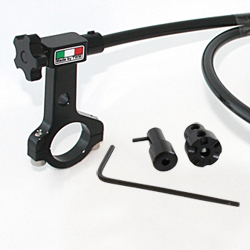 Can be supplied with optional Brembo single or double brake line banjo bolt and washers - with integral hydraulic brake light switch for road/street bikes (please select below). Brembo Radial Front Brake Master Cylinder (16mm Bore, 18 Ratio Long Lever) for Bikes with Single Front Calipers - 125gp, Supermoto Etc. 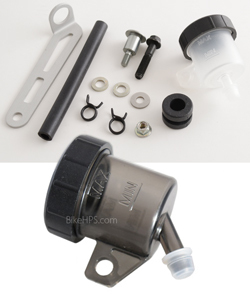 Very neat and high-quality universal replacement clutch or brake remote master cylinder reservoir. Suitable for all Brembo Radial Master Cylinders. 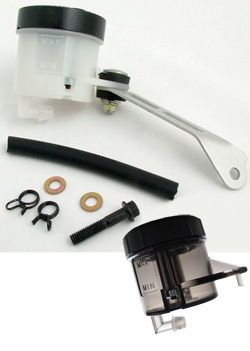 Very neat and high-quality universal replacement clutch master cylinder reservoir. As your brakes become fully hot when riding hard on track, brake feel can often change significantly - so if your brake lever suffers from increasing travel, or if youre having pad fade - this will assist. 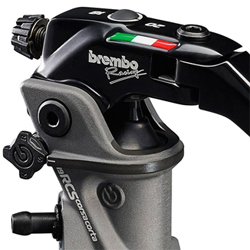 Our remote adjuster allows you to - while riding on the straight - easily adjust the span of your brake lever using your left hand, leaving your right hand free to maintain full throttle making it the perfect complement for a Brembo, Accossato Radial Master Cylinder or your TWM levers. Due to the high quality materials used, the left hand mounting bracket and clamp is extremely slim (7.5mm), to help it fit between your switch-gear and clutch perch and its rotating and lockable head lets you position the knob and initial cable route to assist with clearance. 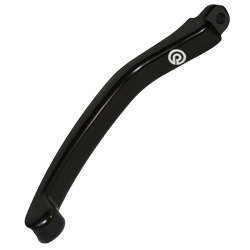 Please note this is the lever blade only, available in standard 148mm length or shorter 122mm. Please note this is the lever blade only.